This July, theater fans will finally be able to see the cast of the famed Broadway musical Newsies as they seize the day and take the stage of the Globe Iconic Store. More than a month before the opening of the show, we are treated with a sneak preview of what to expect in the production brought by the partnership between Globe LIVE and 9Works Theatrical. Newsies is a Disney Theatrical Production first adapted for the stage in 2011. It was based on a 1992 musical film of the same name which features the music of Alan Menken – the genius behind the music of classic Disney films The Little Mermaid, Aladdin, Beauty and the Beast, and more – and the lyrics of Jack Feldman. It is inspired and is based on the real-life newsboy strike of 1899, where a group of boys started a strike in New York to improve the compensation of the child labor force of newspaper hawkers. The original staging of the musical was nominated for 8 Tony Awards, winning Best Choreography and Best Original Score. The local staging of the musical is directed by Robbie Guevara who also headed the Filipino production of American Idiot and A Christmas Carol. Although the show will be featuring the same story and songs from the Broadway production, he assures the audience that they will bring out something new and different to the show, especially through PJ Rebullida’s choreography. Newsies stars Gian Magdangal as the leader Jack Kelly, Danielle Chopin as Katherine Plumber, Jef Flores Davey Jacobs, Pinky Marquez as Medda Larkin, Raymund Concepcion as Gov. Teddy Roosevelt, and more. 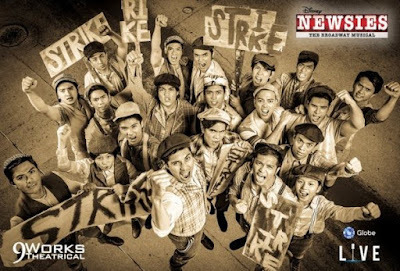 The members of the casts of Newsies underwent rigorous training sessions under Training Ground to develop their singing, dancing, and acting – making them a triple-threat in the theater. According to Globe LIVE executive producer Joe Caliro, this is to elevate and to hone their skills to be world-class performers. Globe LIVE’s Newsies will have a month-long run during the weekends of July, from July 7 to July 30. Tickets are available now at https://www.ticketworld.com.ph.